Treat yourself and a special someone to delectable sautéed scallops in an orange-miso sauce. In a cup, whisk the zest, juice, miso and mirin and reserve. Pat the scallops dry with paper towels and sprinkle the tops with half of the paprika. Have a plate ready to hold the cooked scallops. Place a large cast iron or stainless steel skillet over medium high heat and heat for about one minute, until it is hot. Add the olive oil and butter and swirl to coat the pan. Place the scallops in the pan paprika side down and sear 2 to 3 at a time, undisturbed, until the bottom edges look browned and are starting to crack. Sprinkle the un-seared tops of the scallops with remaining paprika, turn and cook for 2 to 3 minutes, until firm when pressed with a fingertip. Transfer to a plate and cover loosely with a pot lid to keep warm. Reduce heat to medium and add the white parts of the scallions, stirring for a minute. Stir in the miso-orange sauce and bring to a boil for 1 to 2 minutes, until the sauce is slightly thickened. 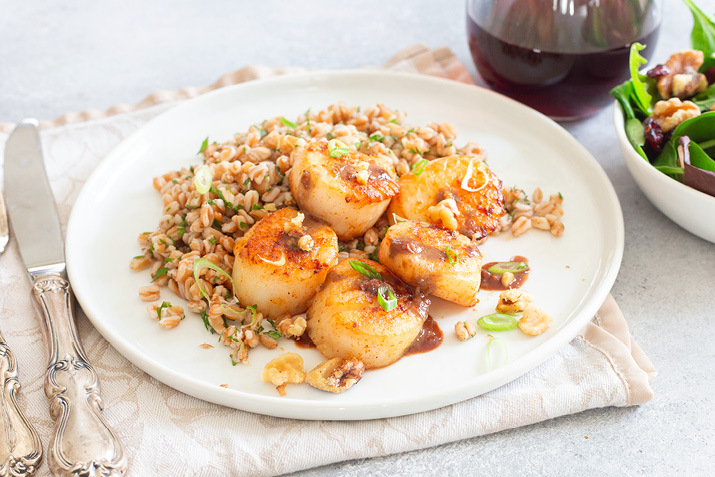 To serve, place scallops on a plate, drizzle with sauce and top with toasted walnuts and scallion greens. The miso-orange sauce for this dish is delectable, so make sure you serve with a bed of rice, noodles, or some crusty bread to soak it all up. Add a side salad or steamed broccoli for a finishing touch.